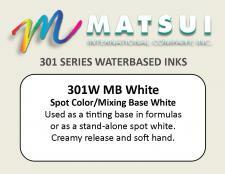 301W-MB White is a stand-alone spot color white and is also used in mixing formulas to increase opacity or create pastel colormatches. 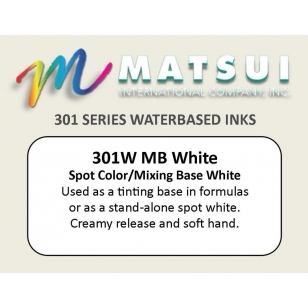 Matsui 301W-MB White 5.0 Great water based ink 11/28/2018 By Zeke I've been using this water based ink for 7 years. I buy it by the 5 gallon bucket. Never had a problem. 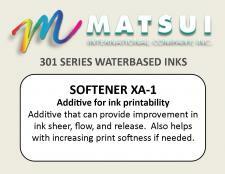 Prints great, cures great. Easy to work with.